"In Germany especially, the Inquisitors charged with the task found themselves hampered by skepticism. 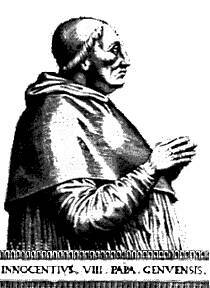 In 1484, therefore, they turned their steps toward Rome for help, and on December 5th they won from the new Pope, Innocent VIII, a bull which once for all closed the months of doubters and compelled the cooperation of German authorities, both ecclesiastical and lay. This bull, known from its first words as Summis desiderates, runs as follows"
[Original Latin Text] - "Translations and Reprints from the Original Sources of European History Vol.III No. 4 pg 7 (1907), published by the University of Pennsylvania.